Welcome to day two of my four years / four giveaways! 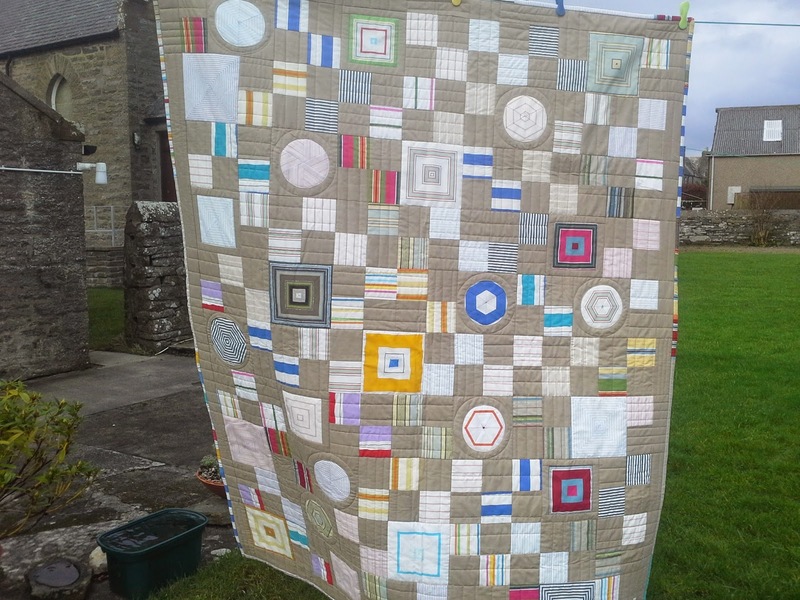 My second year of blogging had my Stained Quilt along amongst other things, and I still cant believe so many people wanted to make my quilt! Freakin AMAZING! But not quite as amazing as the first ever Fat Quarterly Retreat in London. I met so many wonderful people. I'm so lucky to be able to call so many of them dear friends! It was also in my second year of blogging that I started a project with some stripey vintage sheets. July, I think, was when it was first mentioned. Well, it was finished last week! Makes me think of Brighton, seaside, deckchairs and Mods and Rockers! Quilted by the lovely Troodles. When I got the mini charm packs for day one, I got an extra Happy Go Lucky pack. I LOVE this line. Its fabulously retro, I love the bright colours, its just gorgeous! Today I would like to giveaway this cushion (pillow for USA!) , which I made with my mini charms. Hope you like it! Its nothing fancy, I kept it plain and simple to show off the prints and to show how quick and easy the charms can become something, I think, quite lovely. Its quilted in crosshatch on the front and the reverse is a pillow closure in one of my favourite prints from the line, quilted in straight lines. It takes an 18" insert. Again, giveaway is open to all, but I'll not include the insert outside of UK for postage reasons, I hope you dont mind. Leave a comment to win, make sure you are not a NO REPLY blogger, I'm not chasing after winners, I need to be able to contact you. Giveaway open til December 18th. Nice cushion with a nice line of fabric. I would love to win this for my MIL. I love Happy Go Lucky too! 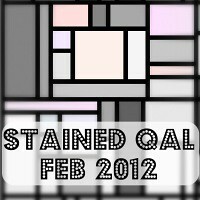 I loved the Stained QAL and have a second version planned. (Like you, though, I have a lot of things planned and very few started. Even fewer are finished!) I love the cushion and would be thrilled to add it to my settee of friends! P.S. I love love love the vintage sheet quilt - wow!!! Loving the vintage sheet reinvention! Cool quilt -is that one for your man or have you got a spot in the new place picked out for it? That vintage sheet quilt is stunning - I don't know how you manage it with such a wee one around. Lovely pillow! Bonnie and Camille do create fab fabric collections!!! And the quilt reminds me of a Kaffe Fassett quilt, that I always have wanted to make!!! Beautiful! Finally I know the difference about cushion and pillow! It is gorgeous! Lovely! That quilt if fabulous! Love the colors and the fabrics! Great job, girlie! I love the look of your vintage sheet quilt and the cushion would be at home with me. I love that quilt, it's so nice to see some of these photos again. Beautiful pillow too. very cute...nice use for those mini charms ! Oh I think Gordon would love this!! First Retreat. Ah the memories. And the Stained QAL. 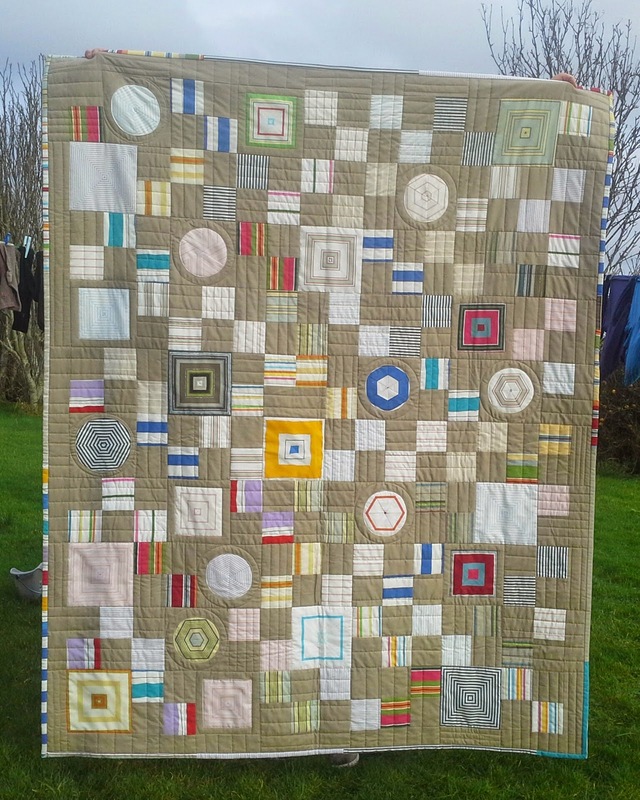 Still one of my most favourite quilts ever. Thanks you! Loving the latest finish. Very cool. I love my Staind quilt, it's such a cool pattern! And a super-pretty cushion - very much my sort of thing!! Cute pillow :) I am one who loved your Stained Quilt and made one of my own. I use it quite frequently too. I love Happy Go Lucky too and I really love that quilt!! !